Why did the cover designer place the track list over the "action"? Strange cover featuring stuff poodles as the center of attention. 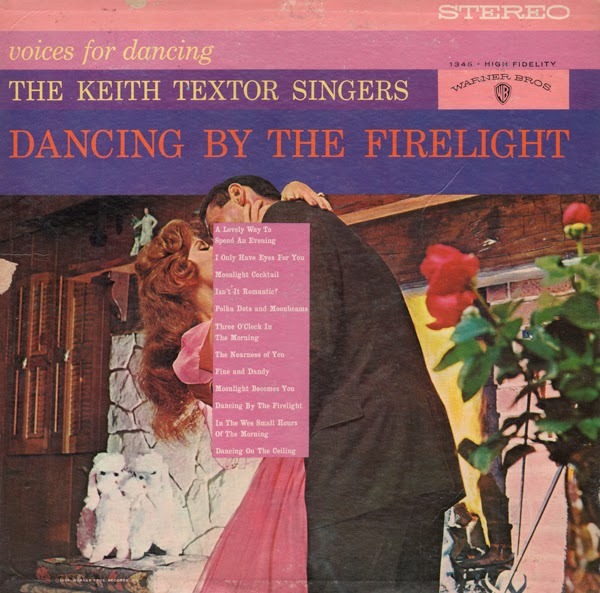 From the back cover: ...there is a reality and presence which the warmth of the Keith Textor Singers brings to the mood album de luxe. Compositions dating back to 550 B.C. but Space Age minimalist good! 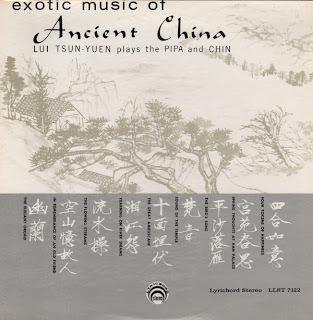 From the back cover: Lui Tsun-Yuen was born of a musical family in Soochow, China. At the age of ten, he took up study of the Pipa and the Chin with the foremost masters in China and was coached by such musical scholars as Wang Yu-Ting and Hsia Pao-Shen. Equipped with a prodigious technique, Lui is a sensitive musician who is completely dedicated to his instruments. 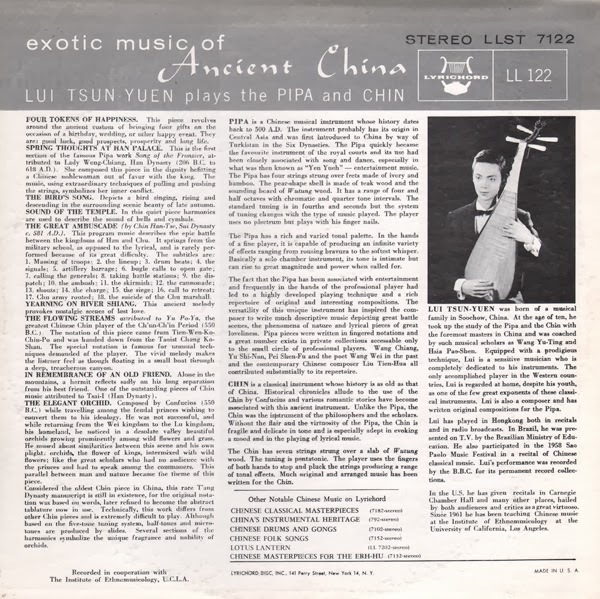 The only accomplished player an the Western countries, Lui is regarded at home, despite his youth, as one of the few great exponents of these classical instruments. 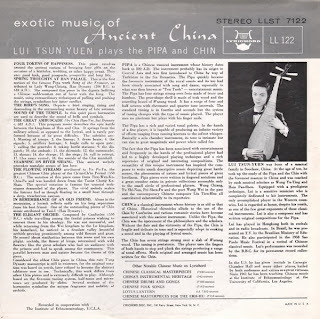 Lui is also a composer and has written original compositions for the Pipa. Lui has played Hong Kong both in recitals and in radio broadcasts. In Brazil, he was presented on T.V. by the Brazilian Ministry of Education. He also participated in the 1958 Sao Paolo Music Festival in a recital of Chinese classical music. Lui's performance was recorded by the B.B.C. for its permanent record collection. In the U.S. he has given recitals in Carnegie Chamber Hall and many other places, hailed by both audiences and critics as a great virtuoso. 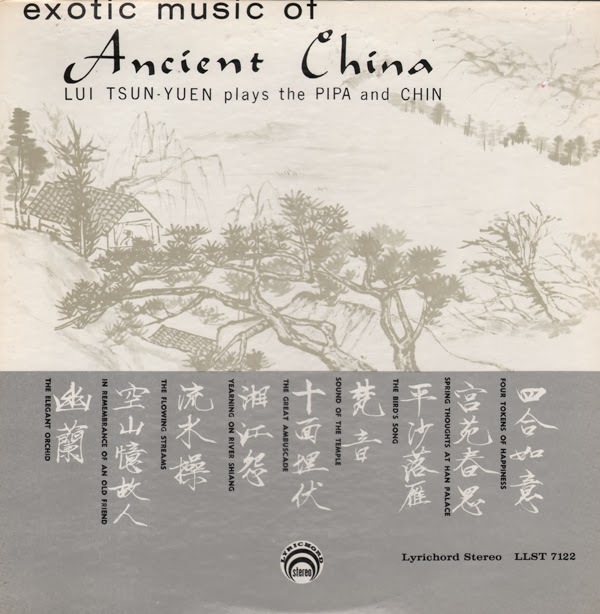 Since 1961 has has been teaching Chinese music at the Institute of Ethnomusicology at The University Of California, Los Angeles.